Oswalt, by no means should be unfamiliar to the fan that stuck it through a difficult 2018 season. The San Diego native was drafted by the New York Mets in the seventh round of the 2012 June Amateur Draft. The righty is a sinker ball pitcher with a fastball that tops out at 94 MPH and has a slider and change-up that needs more work. 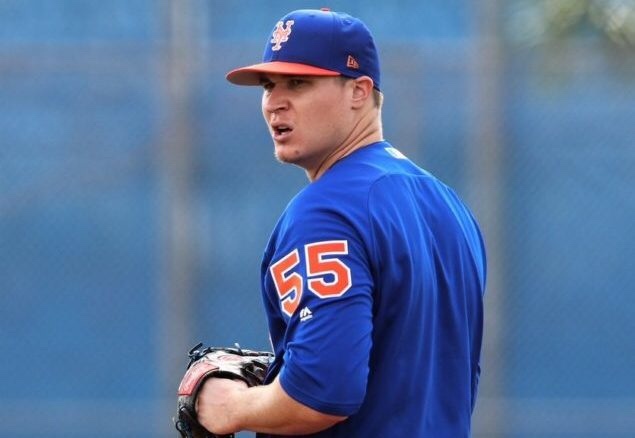 Oswalt spent seven seasons in the Mets Minor League organization, pitching exactly 500.0 innings with a 3.64 ERA while striking out 431 batters or 7.9 and walking 2.2 every nine innings. His Minor League record is also quite an impressive one, he went 41-22 over his seven seasons riding the busses. Oswalt made 12 starts for the Mets during the 2018 season, debuting on April 25th, and I think 99% of the fans would agree when I say Oswalt was rushed to the Major’s and was put in a very pressure filled situation. One could say, “well, seven years of MiLB time is enough time to prep”. Well, for a lot of players, it is, but there’s also just as many players down there that need to hone their skills until they feel it’s been perfected, pitchers especially. Oswalt clearly is the latter, to where he just needed some more time to work on his pitches. In 64.2 innings, he went 3-3 with a 5.85 ERA while giving up 69 hits and 42 earned runs, striking out 45. However, this spring, Oswalt reported to camp in what seemed to be better shape than he was in during the last season. Maybe it’s because he looks and feels betters, maybe he’s just determined to prove that 2018 was a fluke that he deserves consideration to be apart of the best rotation in Major League Baseball. However, it’s transitioning itself into his play his Spring. He’s only pitched 5.1 innings but he’s struck out seven and he’s keeping runners off the bags with a .075 in his three games pitched. The 6″5′ righty is fighting for a spot in the bullpen to where he would primarily pitch in long relief or jump in for one of the regular 5 starters in short notice for a spot start, for whatever the reason may be. Like I said about Bashlor last week, I think we’ll be seeing quite a bit of Oswalt during the season but it would be a great, great thing if we didn’t. Previous What does McNeil taking reps at third mean for Dom and the Mets?